This site is a compilation of the writings of the late professor, theologian, and author Dr. J. Rodman Williams. His major work-- the three volume, Renewal Theology is featured here, including reviews, an excerpt from one of the volumes, and Online Study Guides for Renewal Theology. 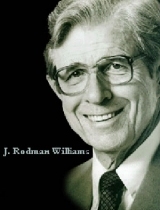 J. Rodman Williams, born on August 21, 1918, in Clyde, North Carolina, son of John Rodman and Odessa Medford Williams. He was a Phi Beta Kappa graduate of Davidson College in 1939, earned his B.D., and Th.M degrees, 1943-44, from Union Theological Seminary in Virginia, and was ordained in the Presbyterian Church in 1943. He served during World War 2 in the Pacific as chaplain with the First Division of the Marine Corps, 1944-1946. After the war, he earned a Ph.D. in philosophy of Religion and Ethics at Columbia University and Union Seminary. He became chaplain and professor of philosophy at Beloit College in Wisconsin 1949-1952, pastored the First Presbyterian Church of Rockford, Illinois 1952-1959, taught theology and philosophy of religion at Austin Presbyterian Seminary in Texas 1959-1972, and served as president and professor of theology at Melodyland School of Theology in Anaheim, California 1972-1982. Beginning in the fall of 1982, he taught theology at Regent University School of Divinity in Virginia Beach, Virginia, and became Professor of Renewal Theology Emeritus there in 2002. Williams authored many books, his magnum opus being a three volume work entitled Renewal Theology (Vol. 1, God, the World, and Redemption, Vol. 2, Salvation, the Holy Spirit, and Christian Living, and Vol. 3, The Church, the Kingdom, and Last Things. The three volumes are presently published as one unabridged volume of Renewal Theology: (Zondervan, 1996). Williams was very active in the charismatic movement as an early president of the international Presbyterian Charismatic Communion, as a participant for several years in the Vatican's Catholic Charismatic-Pentecostal dialogues, and as the organizer and leader of the first European Charismatic Leaders Conferences. He also served a term as president of the Society for Pentecostal Studies. An article about J. Rodman Williams' life and teachings may be found in Handbook of Evangelical Theologians, published. by Baker Book House, 1993. A Festschrift entitled Spirit and Renewal: Essays in Honor of J. Rodman Williams, ed. by Mark Wilson, published by Sheffield Press, 1994, plus further biographical data found (under "John Rodman Williams") in the Dictionary of American Scholars, Who's Who in American Religion, and Who's Who in America.